Thanks for that Israeli clip! I've never seen that so thanks for the link. Yes, I may do a grab of the audio too, it's pretty good and add it to my bootleg collection of languages. I've found a few more clips from Mexico too which I'll post as well. The Madrid video is one of my favorites too. Wish I could get a full recording of that. I love the light-up Macavity costume. She is, in my opinion, the best Grizabella this production has had yet (Maria Del Sol is still número uno ) What a belt!!!! Here's an interview with the lovely Betty Buckley. 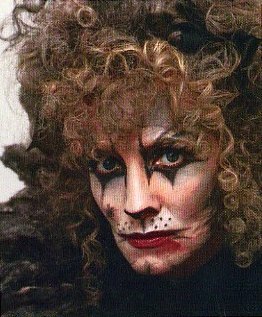 At around 5:23, she tells a very amusing story about applying her stage makeup while she was in Cats. Some new posted vids from the show in Shanghai! Cats celebrates 30 years in Japan!